The Covenanters in Scotland in the 16th and 17th centuries were no exception to this basic reformational trend. They were iconoclastic strippers of the alter. They rejected virtually every cultural manifestation of the holy or transcendent, from the transcendent authority of the English Crown to the actual church buildings themselves. As the Covenanters developed as a particular “People of God” they were confronted with this conflicting need to deny the symbols of their adversaries any transcendent efficacy while at the same time preserving or establishing new symbols and sites of the holy. In other words, of prime importance for the Covenanters was figuring out how, as a movement founded in iconoclastic fervor, to socially consolidate on-the-ground gains and reestablish an effective succession of new symbols and practices of truth and right order across the generations. Covenanters accomplished this by relocating the holy ground in two things: first, in scripture, and second, in a highly regimented and traditional social structure that orbited around a particular identity with several very distinctive social markers. Included among these markers were the Scottish nationalism of the various political covenants, the economic interdependence of a pre-industrial agricultural community, and the social solidarity of a persecuted and oppressed minority. Within this political, economic, and social context, one practice and ritual stands out as exemplary for its ability to symbolically and compactly reflect this shared identity to one another and to the outside world—a cappella psalmody. During the 18th Century, as Covenanters began to emigrate in large numbers to America and the New World, their historic identity began to be tested and strained in new ways. In short, the Covenanters—like many traditional European groups—ran headlong into the ethos and pathos of America, what one commentator has called a desire for endless fresh starts. America was the Protestant principle writ large, and whether Old World Protestant communities could survive in the New World they had begat was very much in question. The point of the problem was that much sharper in the Covenanter context because their symbols and social markers were so perfectly attuned to and representative of their Old World experience. During the slow transition which occurred between, say, 1800 and the 1940s, as the Covenanters went from a poor, rural, agrarian, politically and socially outcast people to increasingly mercantile, middle class, (sub)urban, and politically and socially connected people, the symbols of Covenanter identity began to “leak.” That is to say, the symbolic significance of Covenanter psalmody and indeed its entire function as a symbol illuminating the community’s corporate identity became opaque over time. Like a darkening pane of glass, the meaning of and beyond Covenanter psalmody grew harder and harder to see as each passing generation became further removed from the original experiences that had engendered the ritual—both its meaning and authority—in the first place. For example, communal worship through a cappella spirituals loses its capacity as a compact carrier of social identity when its context shifts from the fields to the factory, or, even worse, the office. Key to understanding the “bleeding out” of Covenanter identity is understanding that this is not mere nostalgia for a bygone era. It is no coincidence that the fallout from this transition over the last seventy-five years has been a decline in the Covenanter church: fewer congregations, fewer members, fewer missionaries, and most dramatically, fewer Covenanter adults who were once Covenanter children. This is because as vitally important social symbols such as a cappella psalmody leak truth, they likewise leak authority. In other words, they lose their stickiness; their ability to bind the allegiance of successive generations to the truth, identity, and memory they carry. This is the way peoples die. 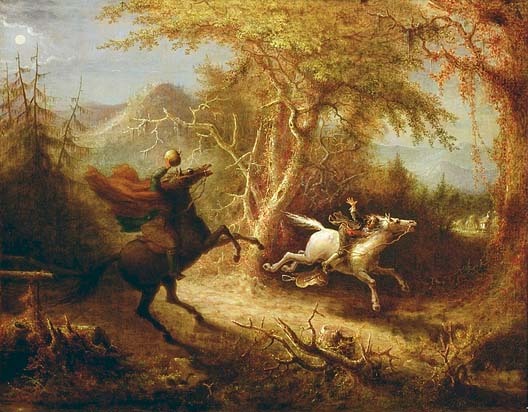 To illustrate let me turn to one Covenanter writer’s poignant grappling with these problems in a story still familiar to us: Washington Irving’s The Legend of Sleepy Hollow. Irving was born in 1783 of strong Scotch Covenanter stock into a family of aspiring New York merchants. His father’s stern and austere Presbyterianism remained a heavy influence on Irving throughout his writing life. In 1819 he published a collection of essays and stories—including both Rip van Winkle and Sleepy Hollow—which would make him the most famous American author of his generation. His greatest ghost story, The Legend of Sleepy Hollow, concerns the gangly and awkward schoolteacher, Ichabod Crane, without a doubt the most celebrated Covenanter in all of literature. It would be incorrect to claim Sleepy Hollow as an allegory of Covenanters in the New World. It is something at once less and more: the literary outworking of a man who is dealing in an ambient way with the changes wrought on his own identity. Ichabod Crane is a Scottish Presbyterian, a Covenanter, who has moved to the village of Sleepy Hollow, a Dutch enclave in the Hudson River Valley, to take the position of headmaster at the village schoolhouse. He is a bachelor, hardworking, and presented as someone who is honest and good yet socially awkward and, at times, insufferable. Significantly, perhaps the most distinctive characteristic Irving gives Ichabod is that of a psalm singer. He is never without his handy pitch-pipe and he moonlights as a voice coach teaching some of his Dutch charges how to sing the psalms. Notice Ichabod’s position: he is alone, yet intent on joining the community of Sleepy Hollow; he is a teacher of others’ children, yet has none of his own; he is the representative of empirical rationalism who nonetheless, Irving is clear to tell us, has an earnest belief and interest in witches, ghosts, and spirits. With Ichabod Crane, Irving evokes the melancholy and ambiguity of Covenanter identity as it endured the transition from Old World to New World. As the story unfolds, Ichabod becomes engaged in a romantic contestant for the hand of the young Dutch heiress of Sleepy Hollow. His rival is Brom Bones, the strapping Dutch boy, Sleepy Hollow’s most eligible bachelor, who is given all the dynamic qualities of the New World itself—opportunism, optimism, high-spirits, independence, and rugged individualism. Brom Bones desires nothing more than to see the back of Ichabod Crane. He torments Ichabod with an escalating series of taunts, pranks, and social embarrassments. Tellingly, at one point, Bones trains his dog to whine in a manner intended to mimic and mock Ichabod’s incessant Psalm singing. Ichabod is steadfast, however, and will not be driven out of Sleepy Hollow so easily. Brom Bones is forced, finally, to capitalize on Ichabod’s lingering Old World fascination with spirits and ghosts. At a youthful fireside party, Bones regales the huddled gathering with the tale of the Headless Horseman, a specter haunting the woods around Sleepy Hollow. Later, while riding home from the party, Ichabod is accosted by none other than the ghost of the Headless Horseman (who is in fact Bones himself) and flees Sleepy Hollow in terror, never to be seen again. The school-house being deserted, soon fell to decay, and was reported to be haunted by the ghost of the unfortunate pedagogue; and the plough-boy, loitering homeward of a still summer evening, has often fancied his voice at a distance, chanting a melancholy psalm among the tranquil solitudes of Sleepy Hollow. With this final passage, Irving suggests that in the New World, psalmody—the clearest social identifier of Covenanters—may itself become one of the ghosts haunting the demythologized American scene as its practitioners become cut off from the experience and membership of their forbearers. Sleepy Hollow raises a key question: as traditional Old World identity markers are threatened by such distancing and encounters with the pluralism of other forms—like Brom Bones’s whining dog—how should those threatened respond? With Ichabod Crane, Irving gives us a poignant example of the danger of what I will call an “over articulated” reaction. That is to say, Ichabod’s Old World commitments are turned against him causing him to flee in favor of the worldly consolations of mercantile success and the reduction of his Old World identity to a ghostly inhabitant of old wives’ tales. The authentic posture of a member of a community towards his community is one of those natural and deeply human things that may easily become highly unnatural and potentially turned against itself when it becomes articulated. Nothing will kill a friendly fellowship faster than incessant and explicit talk about “the community.” The problem is especially acute within traditional, Old World economic, cultural, and religious communities in a highly mobilized, mechanized, and pluralistic state in which they become conscious of what they have lost or are rapidly losing. Attempts to compensate, renew, or restore often only increase the problem of over articulation. Most Covenanters rightly resist when they sense a declining or weakening commitment to Covenanter psalmody. Their complaint communicates something true and wise. But it is shadowed and obscured by the false habit of thought evidenced by the common substitution of the theological phrase “exclusive psalmody” when what most Covenanters really mean to protect and defend is the practice of Covenanter psalmody. In other words, the real complaint has very little to do with theological boundaries. Rather, the real complaint, the real truth and wisdom at work within the complaint, is the perhaps inarticulate sense of losing a socially authoritative identity which might bind one’s children and one’s children’s children. This wisdom need not be set against the theological truth in question. It merely penetrates beneath and behind such questions, rendering them at best, irrelevant, and at worst, a matter for seminarians which is little remarked upon outside such rarified air. The practicing art of psalmody in the context of being a Covenanter in a healthy community of Covenanters means lighting up a whole “little world” or cosmion that is binding. Membership in that cosmion is what makes one a “true Covenanter.” Obscuring the wisdom of the complaint with externalized and objectivized defenses of exclusive psalmody leads inexorably to the mistake of thinking that merely by singing psalms a cappella we might fortify and restore the lost or receding world. But this has becomes transparently false in practice as the full ironic tragedy of over articulation becomes apparent; rituals descend into mere ritualism and the final death of the cosmion is hastened by those who thought to defend it. Let me put my central claim as succinctly and clearly as possible: exclusive psalmody as a theological defense and rationale is not the same thing as Covenanter psalmody, the act and symbol it purports to defend. Whatever its merits as a theological position (and this essay has no quarrel with that position), a commitment to exclusive psalmody can never perform the function of Covenanter psalmody, namely, to create a cosmion, to wield the communal authority necessary to bind a particular People of God. The church that expects such things will crack under the weight and strain of it. The cosmion will evaporate like a wisp in a New England wood leaving behind only haunted formalists on the one hand and disenchanted liberals on the other. Neither group retains the social capacity to do the necessary work of restoring the lost cosmion. It is my fear and lament—hence the eulogy of the title—that Irving has finally proven prophetic and that the communal practice and art of Covenanter psalmody has disappeared as a living location of the holy and transcendent capable of consummating a people. What remains is, instead, a ghostly echo that haunts us with the tragic knowledge of all that we have lost. Paul Tillich, A History of Christian Thought from Its Judaic and Hellenistic Origins to Existentialism, ed. Carl Braaten (New York, 1967), pp. 154-55. Debra Shuger, Habits of Thought in the English Renaissance (University of Toronto Press, 1997), pp. 121-22. Paul Tillich, The Protestant Era (University of Chicago Press, 1948), p. 140. The Covenanters were not the only group to revive the practice of psalmody during the Reformation era. Calvin himself advocated psalmody and other reformed groups, notably the Dutch Reformed, began with a strong commitment to psalmody. See, e.g., J. Kortering, “Psalm Singing: A Reformed Heritage” available at http://www.prca.org/pamphlets/pamphlet_37.html. Other reformed practices of psalmody, however, differed significantly from Covenanter psalmody. For example, Dutch Reformed psalmody was never exclusive. See, e.g., Council of Dordt, Church Order, Article 69 (1618-19). Perhaps for this reason, Dutch and other continental reformed bodies more quickly adapted to the practice of hymnody during the 18th and 19th centuries, especially in America. Moreover, Dutch Reformed and other continental forms of psalmody were rarely practiced a cappella as organs and other instruments were quickly put into use by these ecclesial bodies. See, e.g., Bret Polman, “A History of Music in the Christian Reformed Church” (Grand Rapids, July 18, 1979) (Following the publication of a new Dutch Psalter in 1773, “organ accompaniment to congregational singing was the rule.”) available at http://www.calvin.edu/worship/about/crc/polman.php. Steven Tonsor, “A Fresh Start,” collected in Equality, Decadence, and Modernity ed. Gregory Schneider (ISI 2005), p. 129 (In America, “the notion of a ‘fresh start’ takes on the proportions of a national purpose.”). All quotes and descriptions from Sleepy Hollow taken from Washington Irving, The Sketch Book (New York, 1819). Though there is no space here to develop the point, it is also instructive to consider Irving’s genius in naming his fading Covenanter character Ichabod. For “Ichabod” was the iconoclastic call of the Covenanters against every form of “popery” and “tradition of men.” See, e.g., Walter Scott, Redgauntlet (Edinburgh, 1824) (Scott’s Covenanter novel set during the Jacobite revolution of 1745, in which one Covenanter “did nothing for six days but cry out, ‘Ichabod, Ichabod, the glory is departed from my house!’ and on the seventh he preached a sermon.”). See also, e.g., Thomas Sproull, “The Duty of Social Covenanting,” (Pittsburg, 1841) (Sproull was the pastor of the Reformed Presbyterian Church of Pittsburg. He wrote: “It is time for those churches that have been long indifferent to their duty [to the national covenants of Scotland] to awake. Will they too slumber till the day of wrath overtakes them? … Such churches may well be called ‘Ichabod.’ Tekel is written upon them.”) available at http://www.covenanter.org/TSproull/dutyofsocialcovenanting.htm. In Sleepy Hollow, Irving thus recognizes that those who build on a foundation of “Ichabod” may ultimately find themselves torn down by the same standard. It is also significant that Irving provides a Dutch-American setting for Ichabod Crane’s demise. Clearly, psalmody is no longer practiced widely in Sleepy Hollow as evidenced by Ichabod’s having to instruct the Dutch children in its practice. Moreover, contrasting the Americanizing Dutchman Brom Bones with the more traditional Scotsman, Ichabod Crane, cannot help but elucidate the formative power of Covenanter psalmody vis-à-vis other forms of already dissipated reformed psalmody. Eric Voegelin, New Science of Politics, Collected Works vol. V (University of Missouri Press, 2000), p. 109. Caleb Stegall lives in Jefferson County, Kansas. Fascinating essay! I think you could sketch a very similar story among the Campbellites (specifically the Church of Christ), who sprang up largely from the Presbyterians, and who also sing acapella. Increasingly, as the group moved from agrarian to bourgeois, such “quirks” became out-of-place. Truth and authority have leaked out of our practices, and we are slowly experiencing the inevitable split which you have described. Unfortunately, there is little place in our theology for tradition or a sense of cohesiveness across generations – in fact, such things are explicitly forbidden. Thus, we are left only with the theological arguments which, while I believe they are correct, nevertheless seem to become less and less compelling with each generation. Unless we can make a place in our ecclesiology for history, I fear we are doomed to drift away on the cultural tide, save a few ghosts who linger on in the deep country, but have lost the ability to influence their world. Thanks, Caleb, for republishing this essay. I’m not certain, however, where you stand about the means of either creating or sustaining a cosmion. I think that you will assert that politics cannot accomplish this task but that politics depends on the cosmion. But somewhere between fate and simplistic claims to manufacture this sort of spiritual or normative center, there are ways of thinking concretely about our social and political order and the necessary conditions for politics. At present I don’t have access to my files, but there is an unpublished essay by Voegelin (probably since included in one of the thousands of volumes in his collected works) that concerns the necessity of communication about essentials. I believe this was a lecture he gave at a conference, but as I recall it goes very much to the question of the necessary conditions to produce a spiritually ordered society that produces “politics,” complete with the necessary elements of deep understanding, of friendship, and of deliberation about ends and means. I wonder if politics understood in the terms you’ve outlined is impossible in the United States but quite possible of flourishing at local or even state levels if the task of self-ruling were primarily lodged in these institutions. Ted, I’m with you here. Would love to see the EV essay. I am a member of the Church of Christ, and fortunately, almost all of them still sing aCapella style. there have been changes, but this style of worship has mostly remained. It’s one of the practices that make us distinct in the protestant world. Interestingly, members of the Church of Christ, often avoid political debates too, for reasons going back to the Civil War, since the congregations were mostly distributed in border states like Kentucky, Missouri, etc. And congregations had members from both sides of the conflict attending in the same churches.I’ve never known them to picket abortion clinics, for instance. mentality every 10 years, is not easy. And we are one of the least changed theologically of denominations. An interesting and sure to be illuminating discussion this: “.communication about essentials”…….However, when everything is “essential”, nothing is, hence the general trend of speaking in circles and waiting for a crisis “not to waste” with our current political system that does not want to be bogged down by such a pesky word as “essential”. Tangentially related: For a very interesting and inspiring look at one traditional style of acapella singing (the so-called ‘Sacred Harp’) check out the documentary called “Awake My Soul” (originally shown on PBS, now available on DVD). Besides being musically fascinating, the film is a great demonstration, in a sort of microcosmic manner, of how tradition ought to function. There is a marvelous moving scene in which one of the singers sermonizes on those in the tradition who’ve gone on before, and how they’re remembered, and as such aren’t really gone. Although he never uses the term, it’s obvious that what he’s talking about is the communion of saints, namely those saints that were part of this particular musical and religious stream. Here’s the trailer for ‘Awake My Soul’…. This is a great essay. As an old English Lit major and recent exclusive psalmist, I never realized the connection to psalmody and the Irving tale. Very well done here.